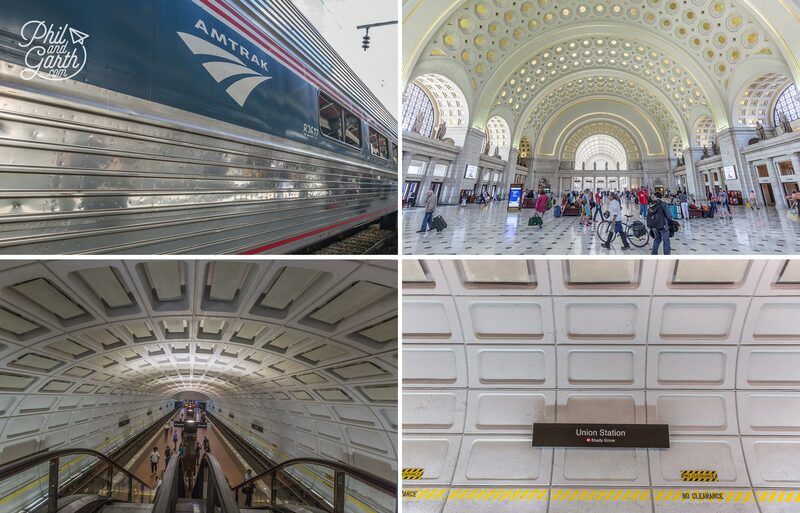 We took an Amtrak train from New York City’s Penn Station to visit a city of monuments and memorials – Washington DC, the heart of the richest and most powerful nation in the world. The train journey is easy to do with comfortable seats and free wifi, but super expensive compared to similar train journeys in the UK. We stopped to admire the classy interior when we arrived at Union Station before taking the Metro to where we were staying in Chinatown. The underground station’s architecture looks cool too, the walls look like a giant waffle pan! When the lights on the platform floor flash it means your train is about to arrive, neat! The Metro has 6 lines and it’s easy to navigate, we ended up using the Metro all the time to get around. 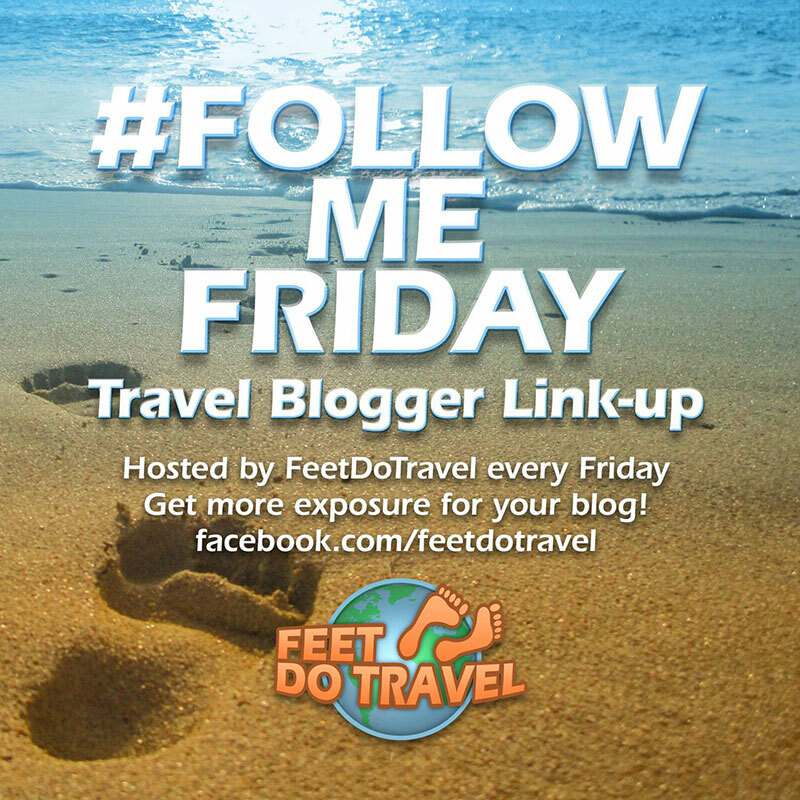 Like any big capital city there’s so much to see and do, so we decided on a 4-night stay so we could take in some of the sights at a leisurely pace. So it’s not a shopping mall (as Phil first thought!) 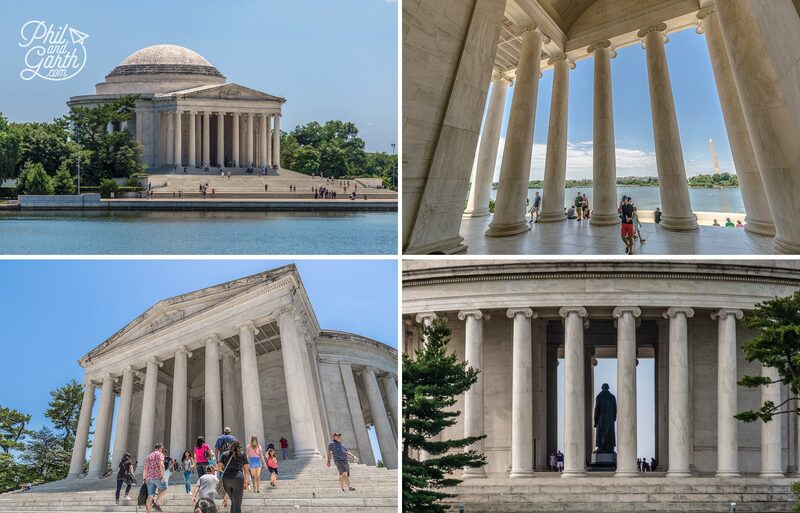 instead The National Mall is actually a US National Park where we learnt about America’s history through the memorials that honour past presidents, leaders and soldiers. Nicknamed ‘America’s Front Yard’ it’s the country’s most visited park so there’s plenty of people, but its vast size means you’ll have plenty of space. 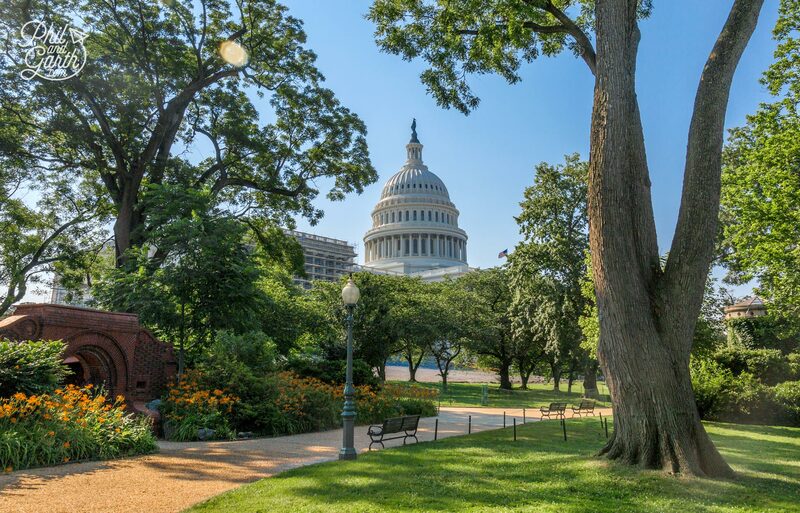 The National Mall is open 24 hours a day and free to visit, so put on your trainers and get ready for lots of walking as this is where you’ll spend most of your time! 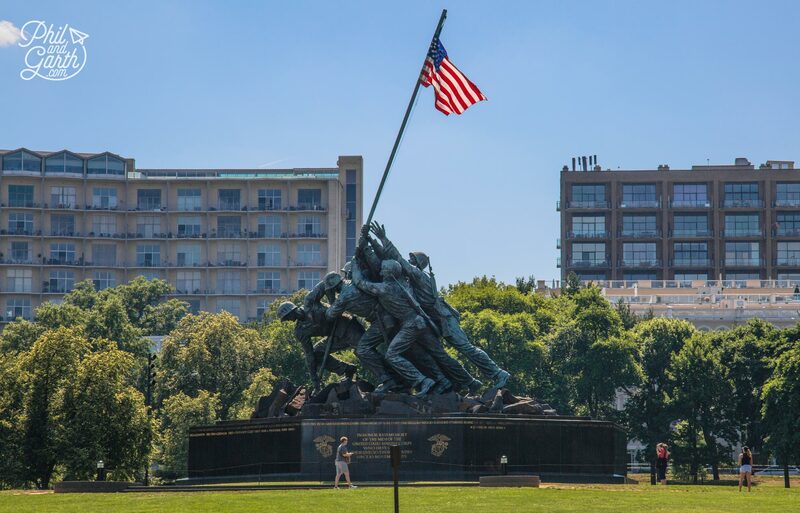 The amount of monuments and memorials in Washington DC is overwhelming for first-timers like us, so we decided to take a free walking tour with DC By Foot to get an overview. It turned out to be an amazing 3 hours, our guide Carolyn was so knowledgable, we love tour guides that can bring history to life. At the end of the tour you normally pay a cash tip, but Carolyn was the first free tour guide we’d ever met that accepted credit cards and PayPal! 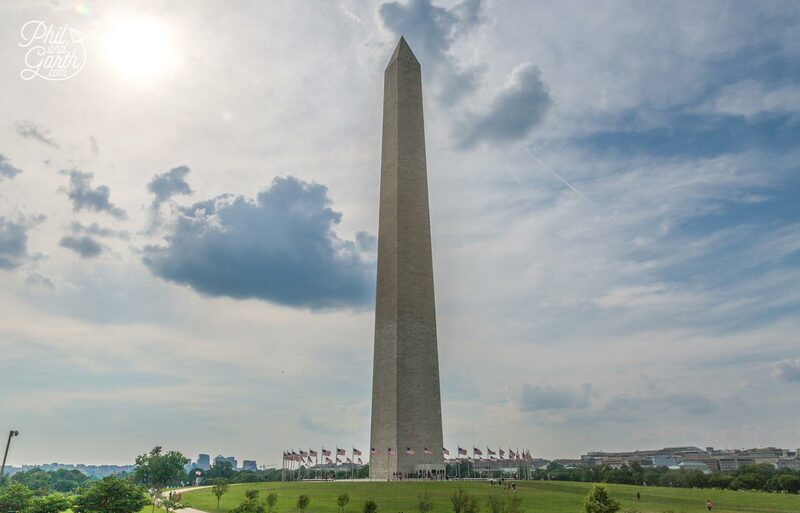 Dominating the centre of the Mall is The Washington Monument standing at an enormous 168 metres tall. 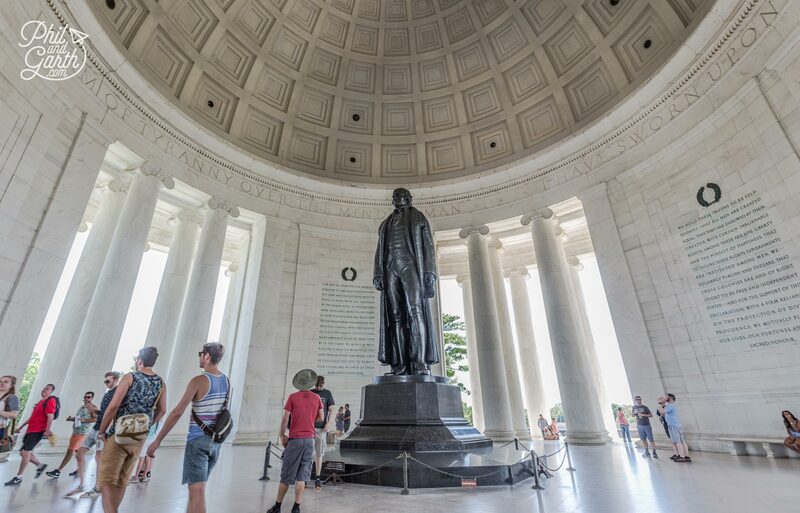 It honours America’s first president George Washington and is the world’s tallest stone structure and marble obelisk, which is hollow inside. You’ll notice it has 2 colours of stone because construction was stopped when they ran out of private money, so it stood as a stump and then the American Civil War started. After the war stone from a different quarry was used to complete the structure. It finally opened in 1888 and was the tallest structure in the world only to be beaten 6 months later by the Eiffel Tower. Honouring America’s 16th president Abraham Lincoln, this is the grandest of all the memorials at the West end of the National Mall. It looks just like the Parthenon in Athens because it was indeed modelled on it, however it has 36 columns, one to represent each state in the USA at the time of the Lincoln’s death. 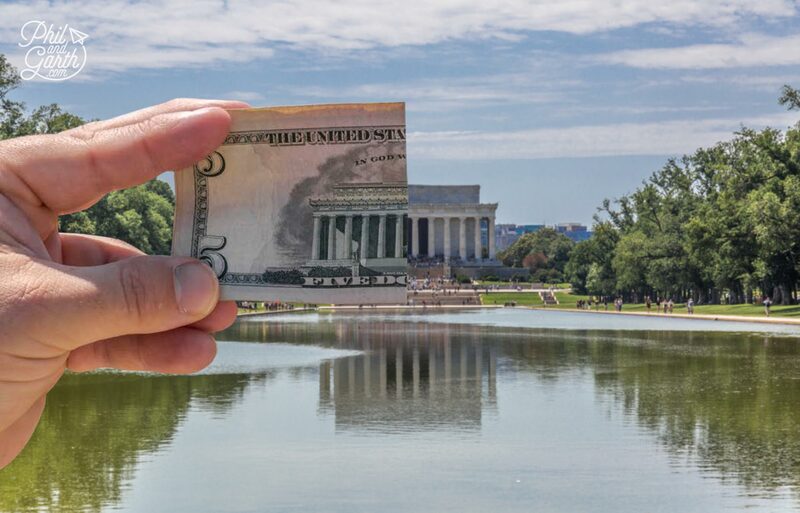 The Lincoln Memorial looks stunning seen in front of the reflection pool. Remember the Forrest Gump scene filmed here? 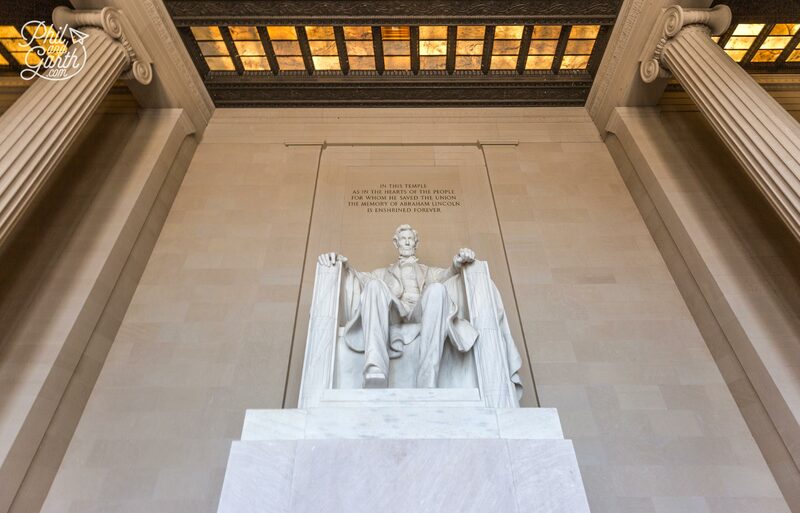 As you walk up the grand steps you are greeted by ‘Honest Abe’ standing 5 metres tall carved in marble he sits in his chair, depicted as a stately figure during the American Civil War period. The words you see etched on the wall are from the Gettysburg Address – a short but career defining speech he gave in 1863 at the battlefield cemetery in Gettysburg. 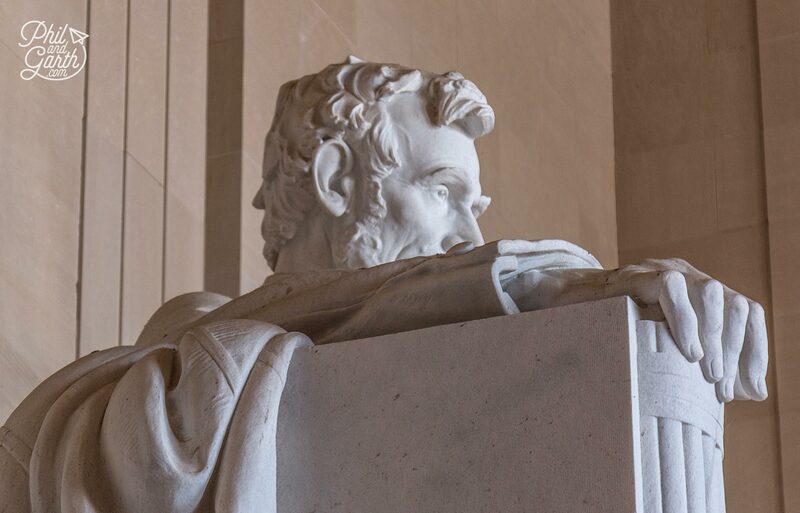 Look closely and you’ll find a hidden face on the back of Lincoln’s head, some people say it’s the profile of his army general Robert E Lee, or is it just an optical illusion? You decide. Can you spot the hidden face of army General Robert E Lee on the Lincoln Memorial? 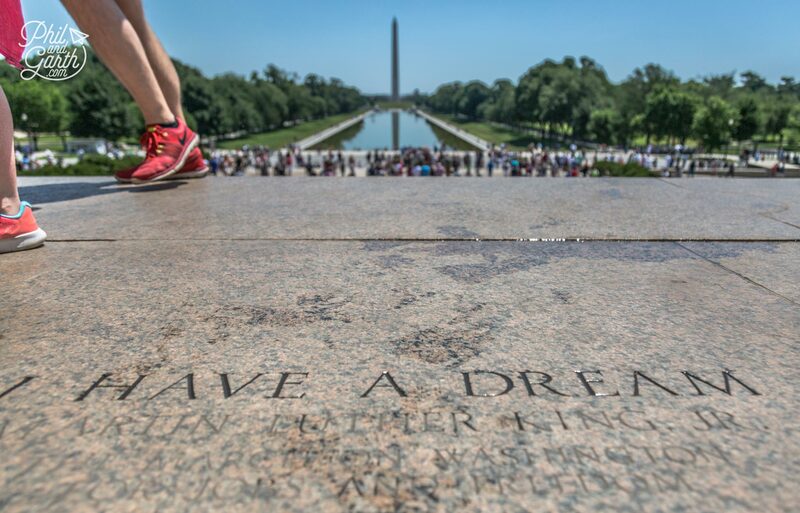 In 1963 thousands of people marched here to witness Martin Luther King Jr deliver his famous “I Have a Dream” speech at the base of Lincoln’s statue, there’s an engraving on the floor marking the exact spot. Phil waited patiently for a scouts group to move off the spot, so he could take a moment looking out. 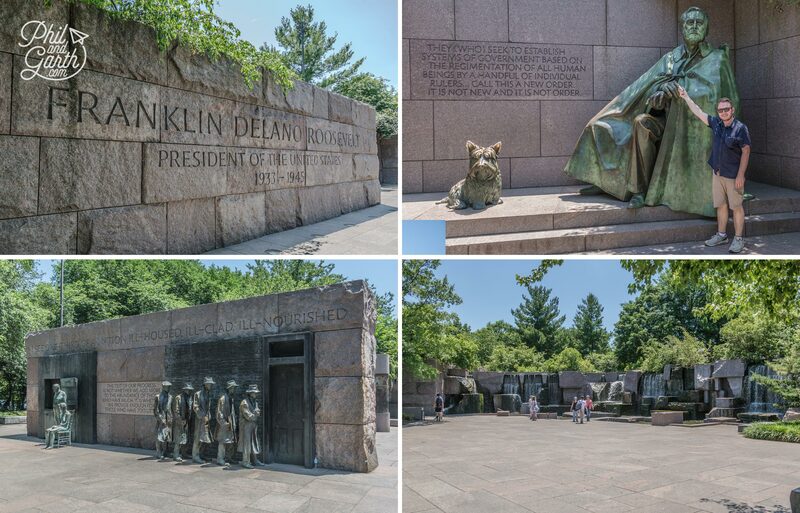 The Franklin Delano Roosevelt Memorial honours America’s 32nd President. 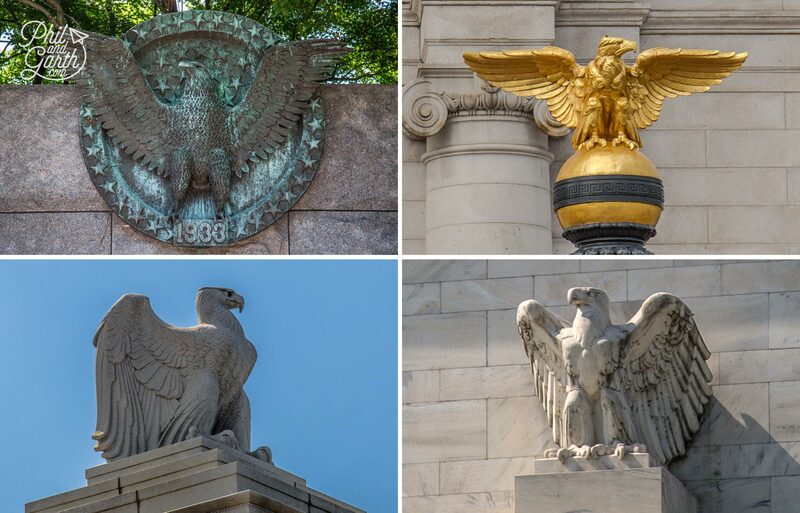 There are 4 outdoor rooms symbolising his terms in office from 1933 to 1945. There are a few sculptures of him, most notably in the 3rd term room where next to his next to his dog Fala, he is depicted on his wheelchair with his cloak disguising the chair – he worked very hard to hide his paralysis from the public. Another room contains waterfalls which symbolise the crash of the economy leading to The Great Depression. 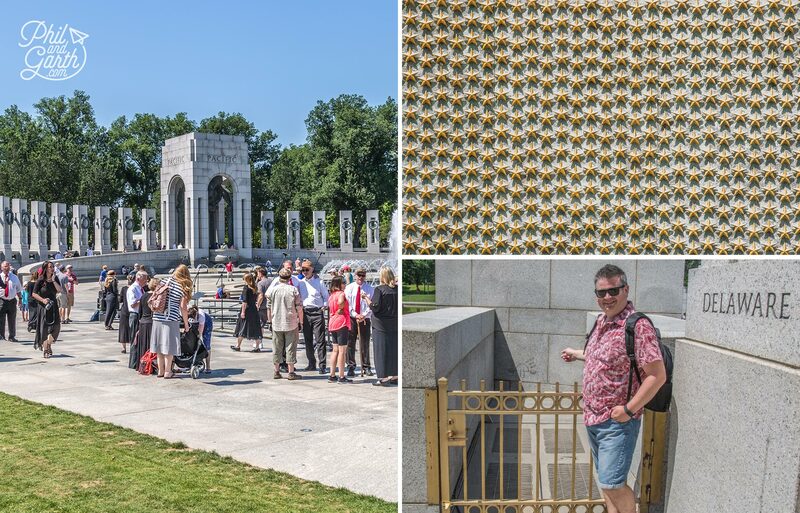 Garth was impressed by how tactile this memorial was with textured surfaces, reliefs and lots of braille for vision-impaired visitors. However some wheelchair users criticised the high placement of the reliefs – some mounted eight feet off of the ground! 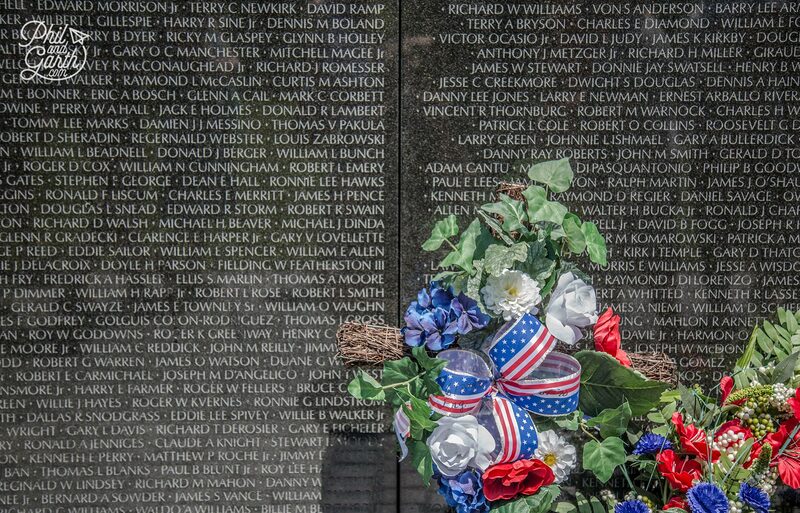 The Vietnam Veterans Memorial memorial is a long black granite wall featuring names of 58,000+ men and women who died in the Vietnam War. 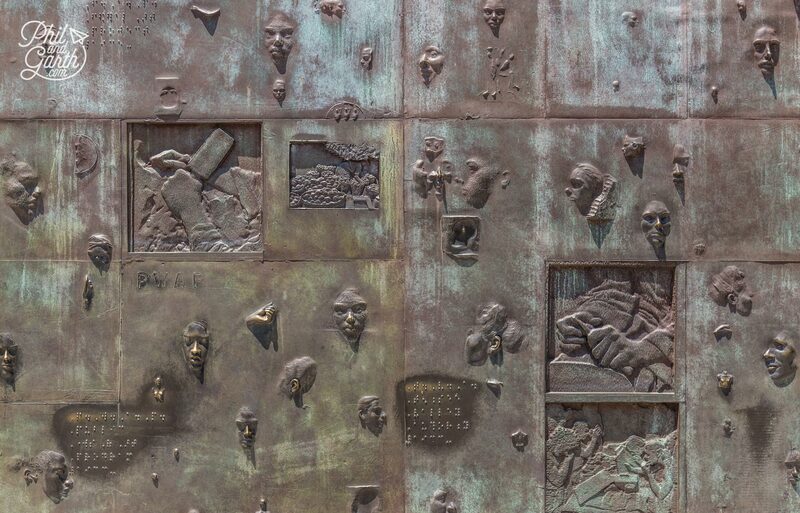 Locals call this memorial ‘The Wall’ and it was very controversial for a number of reasons – some people hated the minimal design, some wanted the money spent on Veterans instead of a memorial and others didn’t like the fact the memorial also commemorates those that survived and came home. As a compromise a statue of three soldiers was installed next the wall. 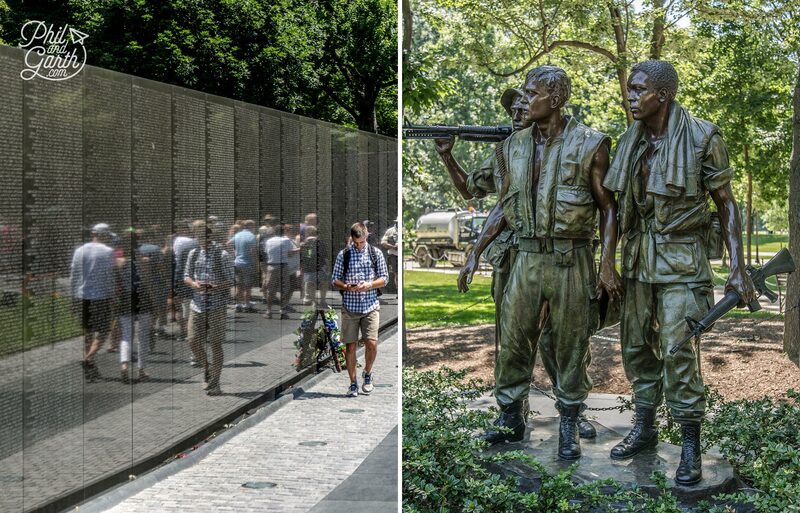 We thought back to how Americans were just as divided over the Vietnam War itself. Next to names 3 different symbols are used, a diamond indicates if a person was confirmed dead, a cross is used if a person is missing, and a circle is used if a missing person comes back alive, as of today no circles appear on the wall. Many relatives come here to take pencil rubbings of names of their loved ones on paper, they also leave flags for remembrance. 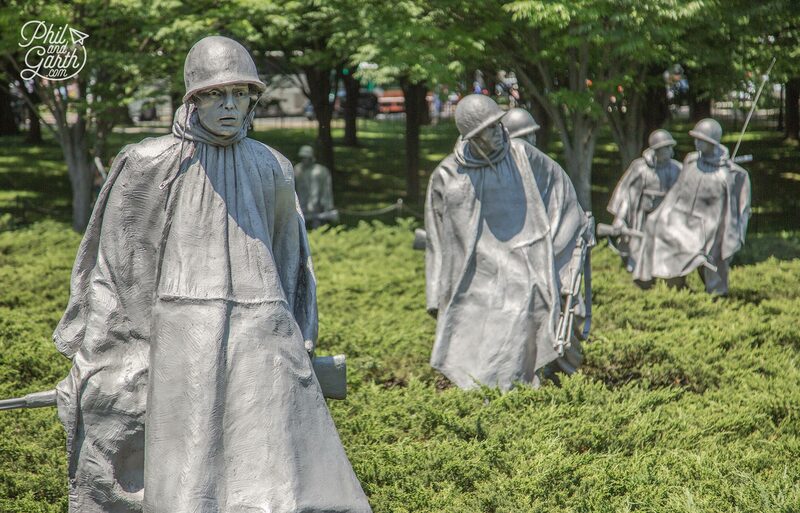 The Korean War Memorial was our favourite because it was the most visual and striking of all the memorials. 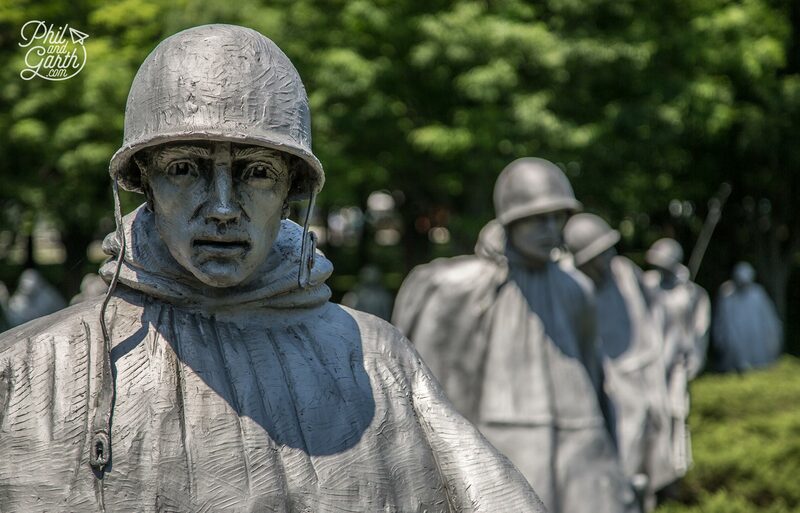 The Korean War is perhaps the least known, where 54,000 allied forces soldiers died, nearly as many as the Vietnam War. 19 statues made from stainless steel represent American soldiers in battle, the Juniper bushes at their feet represent the swamp land. If you look at the statues they are in formation. Every single one is looking in a different direction, thus protecting them all from enemy fire in all directions. 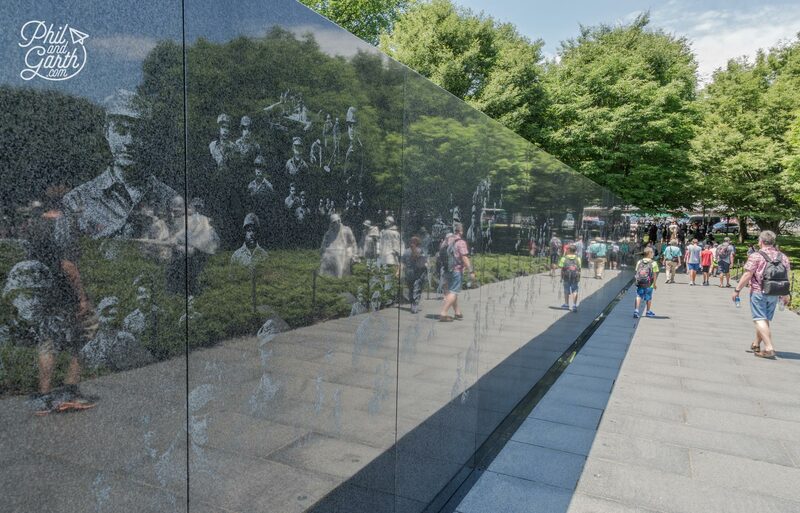 Next to the statues are photographs of real veterans etched onto a long black granite wall that also reflect the 19 statues making a total of 38 soldiers. This symbolises the 38 months of fighting and the 38th parallel (The Korean Demilitarised Zone) which still separates North and South Korea. The National World War 2 Memorial is dedicated to Americans who served during the second World War. 56 pillars represent the US states and territories linked together by bronze sculpted rope symbolising unity between states. 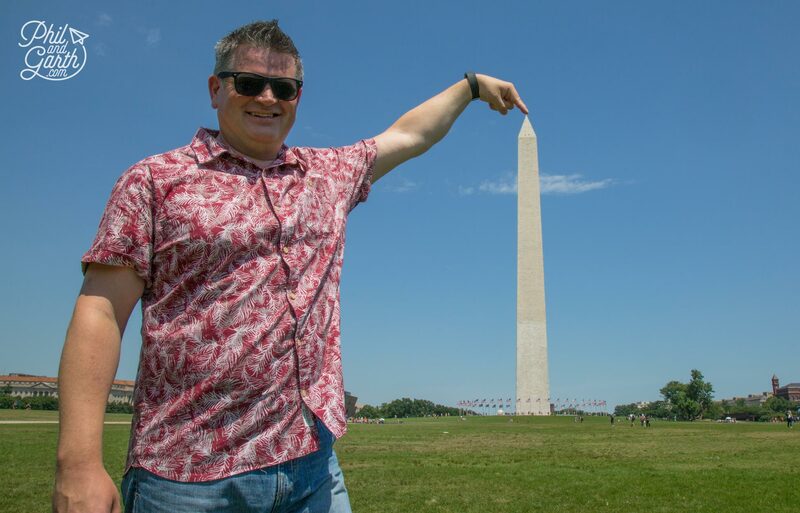 Many visiting Americans take a photo next to their home state pillar. We witnessed a small group of people posing and jumping and thought their selfie-stick behaviour was questionable and a little inappropriate considering this is a memorial. Look out for the hidden ‘Kilroy Was Here’ engraving, Phil is pointing it out in the above photo. The bald-headed man was an in-joke with troops during the war and was graffitied on surfaces by allied forces in Europe and all over the world in a rebellious fashion! At the Martin Luther King Jr Memorial it was a chance for us both to remember and reflect on the world’s greatest civil rights leader. 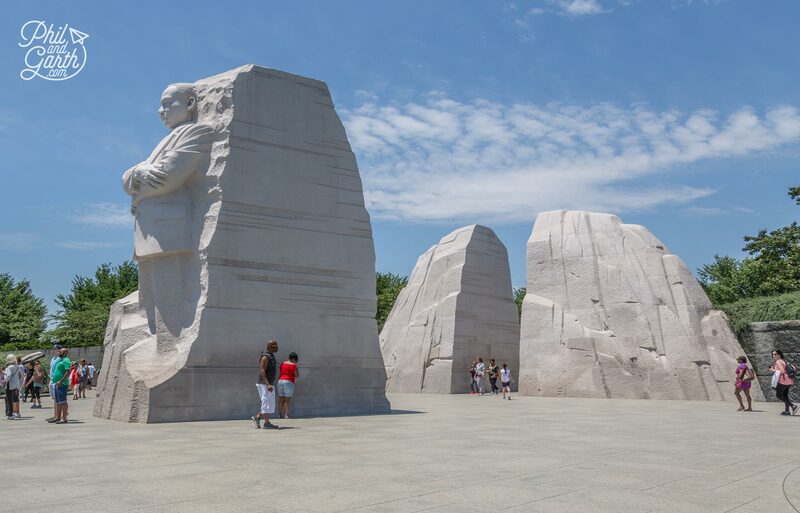 It’s the newest of Washington DC’s memorials which opened in 2011 and is the first memorial on the National Mall to feature an African American. Designed by Chinese sculptor Lei Yixin, surprisingly it was made in China from pink Chinese granite. 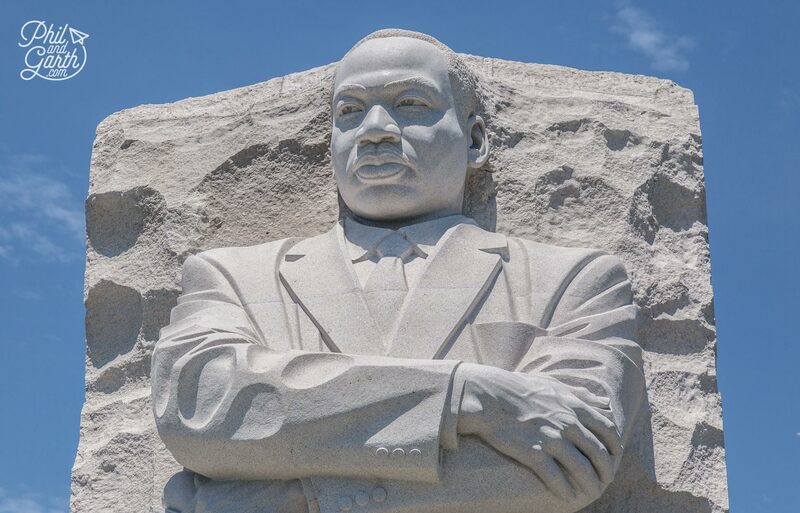 His likeness is carved into ‘The Mountain of Despair’ as he looks out over the Tidal Basin, in his hand he holds his famous speech, ‘A Have A Dream’ which words are carved into the rock, ‘Out of the mountain of despair, a stone of hope’ His unfinished legs symbolise there’s still more work to be done. With so many memorials and so much history to take in, we were getting exhausted! we had the same feeling templed out in Kyoto, Japan. On another day we went back to a couple of the memorials to appreciate them again less tired. 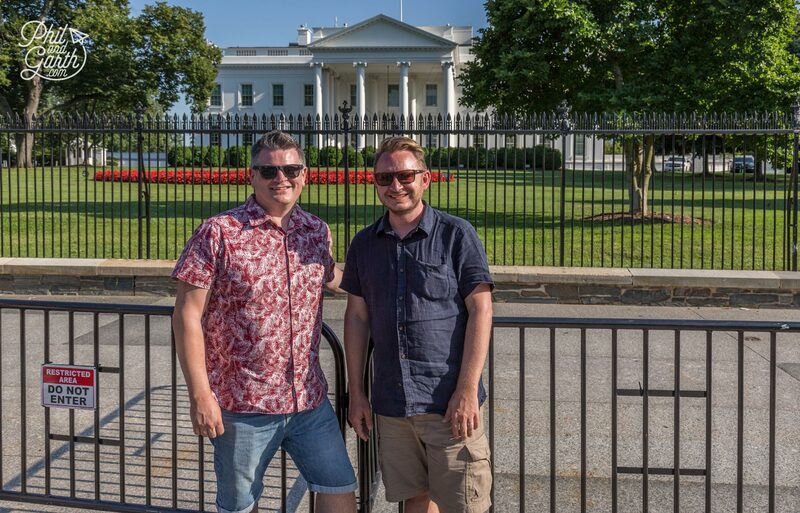 The one thing we were both perhaps most looking forward to was seeing the president’s official home – The White House, It’s so iconic from film and TV and so elegant with its neoclassical architecture. Up close it actually looks much smaller than how we imagined it, but nevertheless impressive. Designed by an Irish architect after winning a competition (most of DC’s buildings and memorials were designed by competition) it was built 1800 only to be burnt down by the British (sorry!) in 1814, and rebuilt in 1817. In later years the East and West wings were added. We were hoping we might catch a glimpse of Melania doing a spot of gardening on the South Lawn or President Trump landing in his Marine One helicopter, but sadly not! 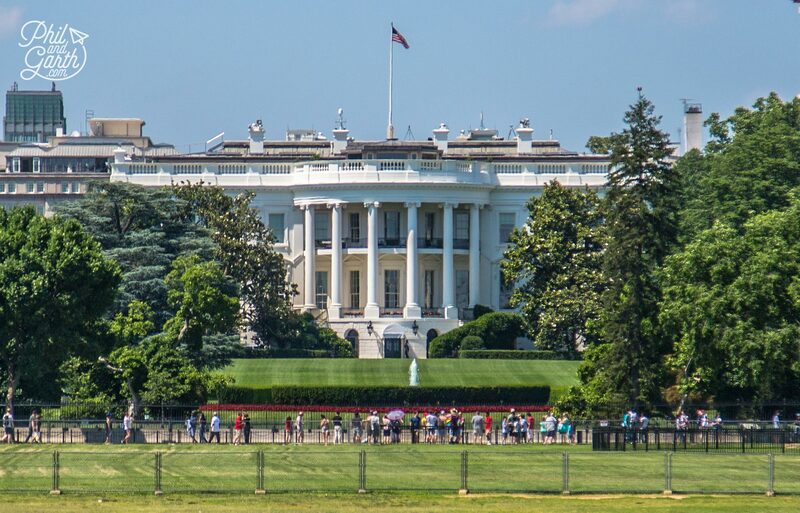 The White House has 132 rooms, 35 bathrooms, and 6 levels in parts. We thought the White House looked immaculate and Garth loved the gardens, especially the simplicity of planting flowers of a single colour, red – a simple and stylish design. 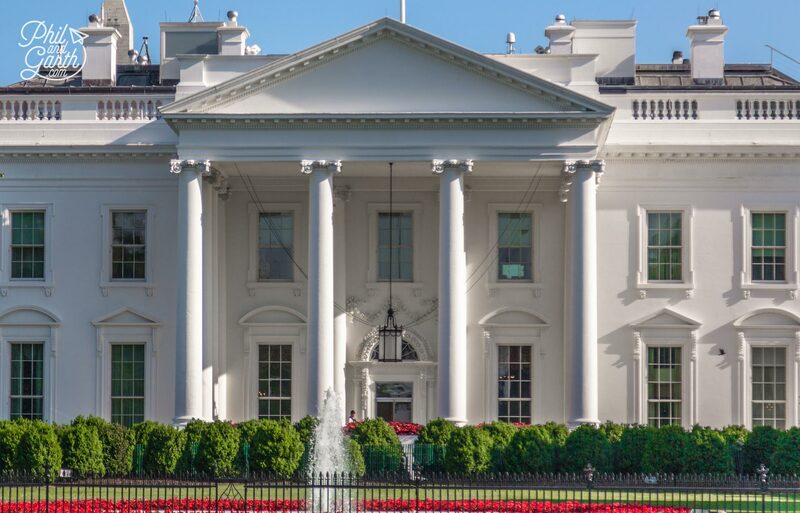 It is possible to tour the White House and it’s is free, however you’ll need to apply for tickets at least 6 months in advance. 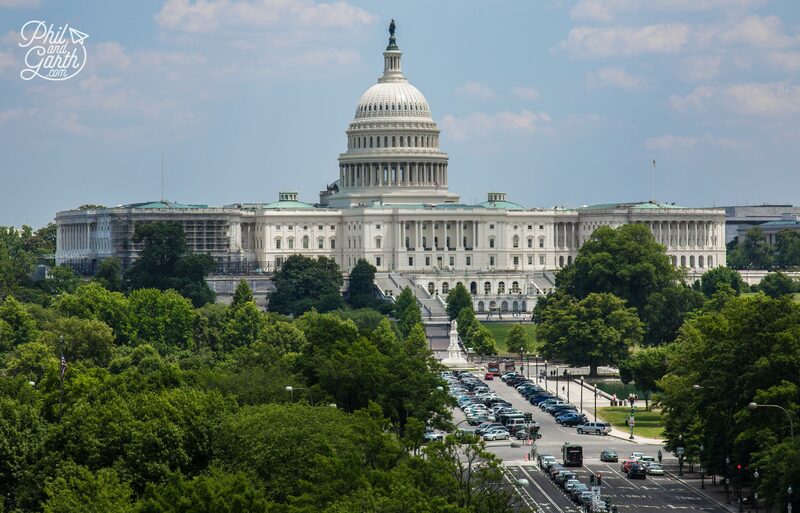 Americans can apply for tickets through their Member of Congress details at the Office of the Member of Congress whilst international visitors can apply through their local embassy based in Washington DC. Now that would be cool seeing the West Wing and the Oval Office! After you’re done admiring The White House take the short walk to The White House Visitor Centre. It’s more than just a shop and has lots of interesting artefacts and exhibits. The 15 minute film is worth watching, and Phil thought quite humbling at times giving an insight into family life within the White House. Next day was an early morning start to Capitol Hill, an area home to the Library of Congress, The Supreme Court and the US Capitol where we were heading. 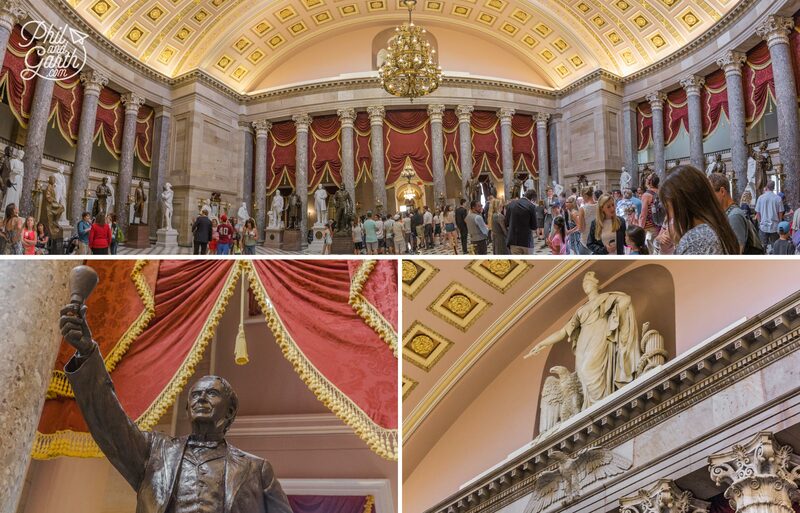 The Capitol Building has two chambers – the US Senate and the US House of Representatives. This is where the country’s laws are made by Congress – where the real power lies. We spent the day trying to work out how many similarities there are with the UK’s political system and chambers of The House of Commons and The House of Lords, and to be honest we’re still a bit confused! 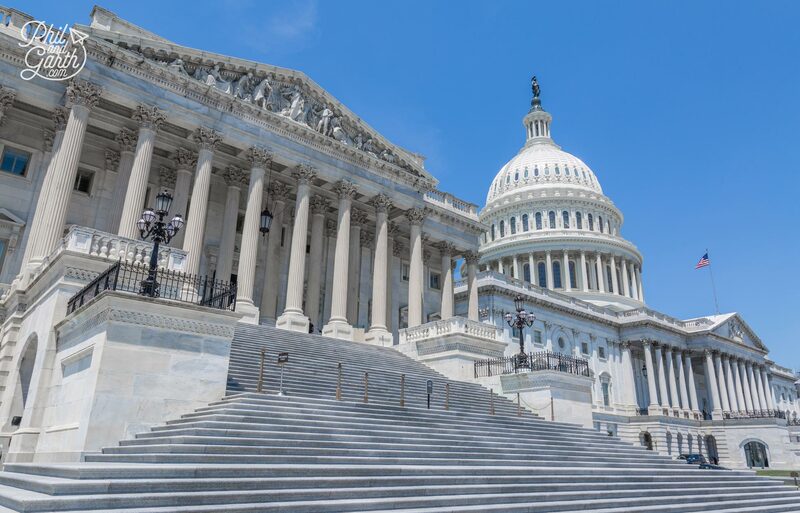 We’ve seen The Capitol’s stately and iconic dome countess times as a backdrop to news reporters on TV, so it was great seeing it in the flesh. This is one of those magnificent buildings of the world that oozes grandeur. Based on a neoclassical design (a style which takes inspiration from ancient Rome and Greece) The Capitol building has loads of columns and a statue which crowns the top of the dome, she is called Freedom and stands 6 metres tall. 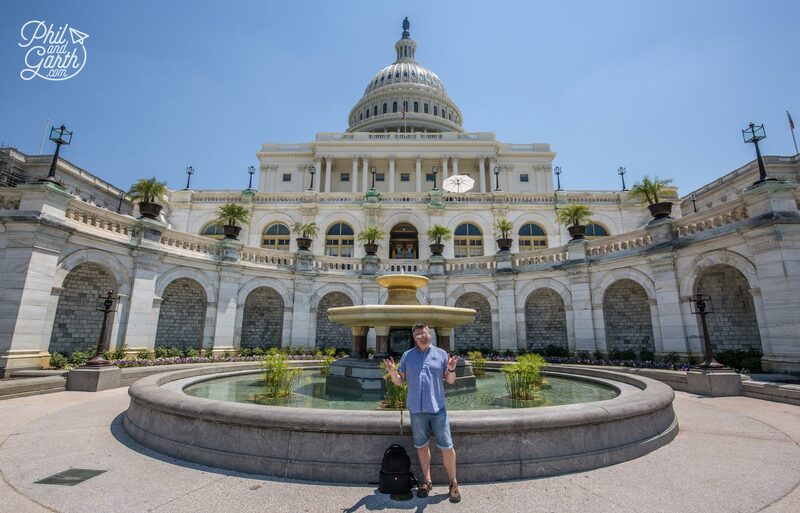 The Capitol reminded us of our trip to Havana where their El Capitolio building was modelled exactly on The Capitol building. We got there at 9.00am, before heading inside we started at the back (or front we’re not quite sure!) of the building. At that time it was nice and quiet plus the sun was shining and the sky was bright blue, so it looked great. Phil thought it was amazing how close we could get to everything, compared to Parliament in London as there’s no perimeter fence or visible security, guess they are there but well hidden. 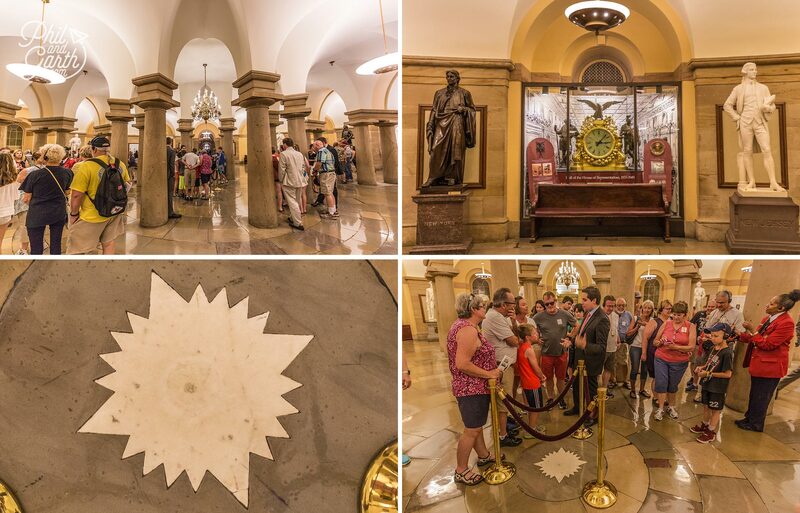 We booked our guided tour of the US Capitol online exactly 8 weeks ahead of our visit. The best part is it’s free, unlike the tour we did around The Houses of Parliament in London, which cost a small fortune! This guided tour is brilliant, really informative, you wear a headset so you can hear your guide amongst the crowds and it lasts for just under an hour. Inside we got to see the Rotunda, National Statuary Hall and the the Crypt. It starts with a really good film about American democracy and the Capitol building. 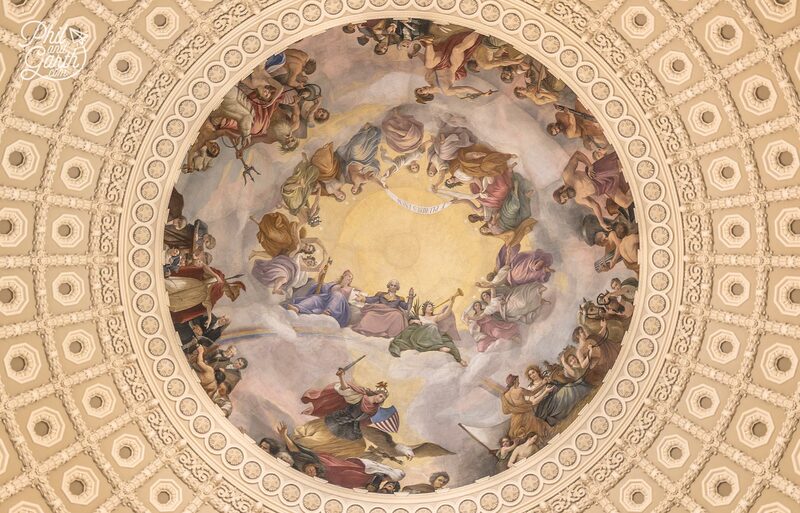 Under the dome of The Rotunda was our highlight it’s absolutely stunning especially the canopy and the fresco “Apotheosis of Washington” depicts George Washington as a national hero surrounded by 13 women and lots of other symbolism. 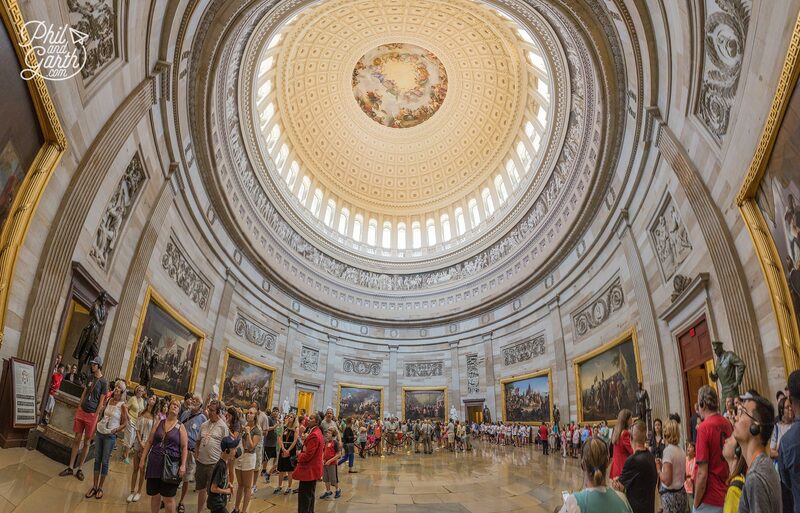 The Rotunda doesn’t serve any legislative function, it’s a ceremonial space for state funerals, receiving special guests and visiting heads of state. After the tour we picked up passes to see The Senate and The House of Representatives which you do in your own time without a guide. We were lucky and got and sit in the gallery of The Senate located in the North Wing which was absolutely fascinating to see. Walking down the beautifully decorated corridors of the Senate is pretty impressive too. The House of Representatives (South Wing) was in session so we couldn’t go in. 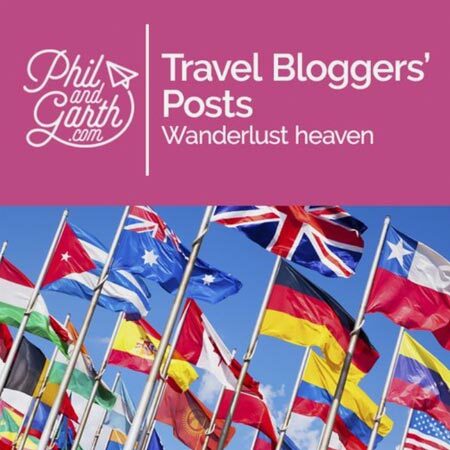 Security is understandably high – you are not allowed to take anything into either chamber and you have to leave all your belongings at the airport-style security desk. We think tours of working buildings are so much more interesting. This is where presidential inaugurations take place. Phil doing his best Donald Trump impression. The grounds of the US Capitol are lovely too, there’s guided tours of the grounds at 1pm Mon-Sat. Apparently if the flag above either wing is raised it means they are in session. Oh and the exterior of The Capitol looks great at night, we didn’t have our camera, but take our word for it. We both work in tv newsrooms so it was a no-brainer for us to visit Newseum – a museum dedicated to the importance of a free press. This place is massive and has some really interesting exhibits, The Berlin Wall Gallery has 8 sections of the wall and explains how tv news helped spread the news to East Germany in an age before social media. 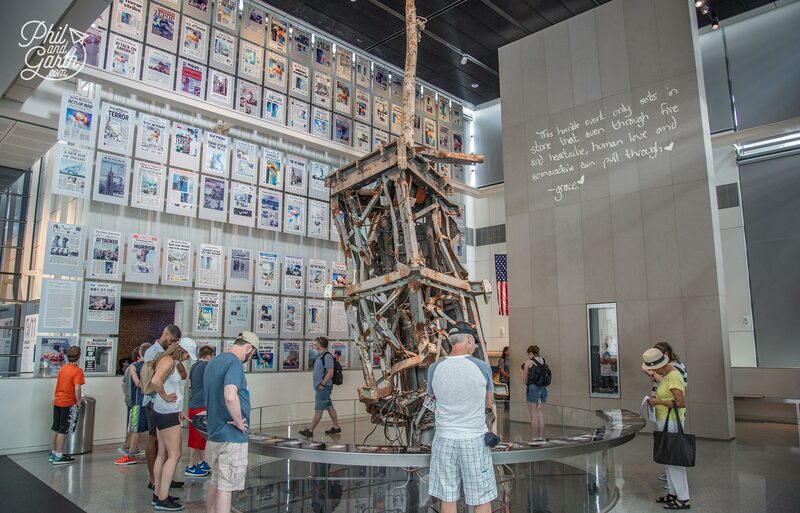 The 9/11 Gallery explores the challenges journalists faced covering the breaking story. Very eerie seeing the transmitter antenna that used to be on the top of the World Trade Center. 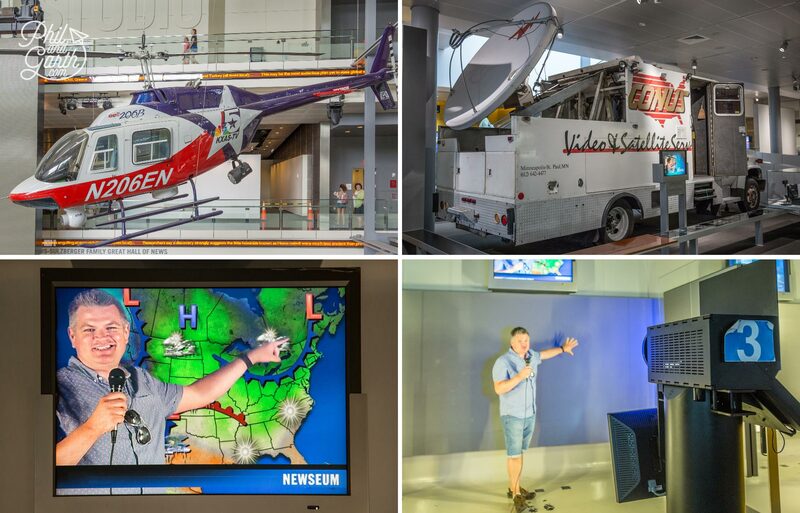 Phil being an engineer geeked out seeing the world’s first satellite news-gathering truck and loved the interactive exhibits, especially playing the part of a weatherman! somebody asked Garth if he was a professional forecaster! Phil tries his hand at being an American weather forecaster! 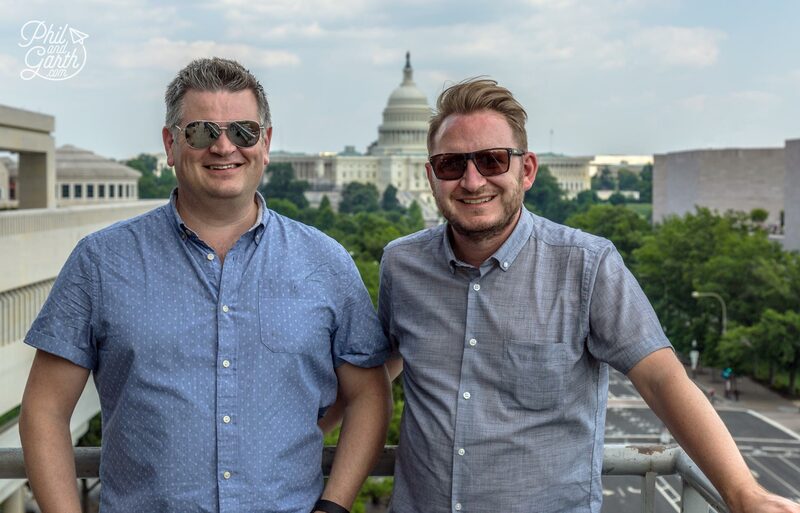 The stand out thing about Newseum is their outdoor deck, which has the best views down Pennsylvania Avenue to the US Capitol – the perfect backdrop for your photos. However overall we did think our visit to Newseum was a tad expensive at $25 each but that could be down to pretty much everything else is free to visit in Washington DC. 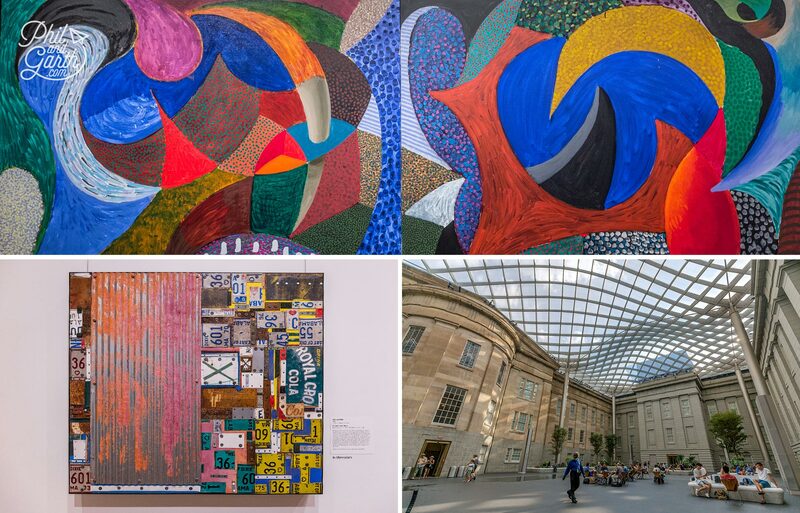 The Smithsonian American Art Museum has one of the largest collections of American art in the world. Garth’s favourite piece here was the Electronic Superhighway video installation. 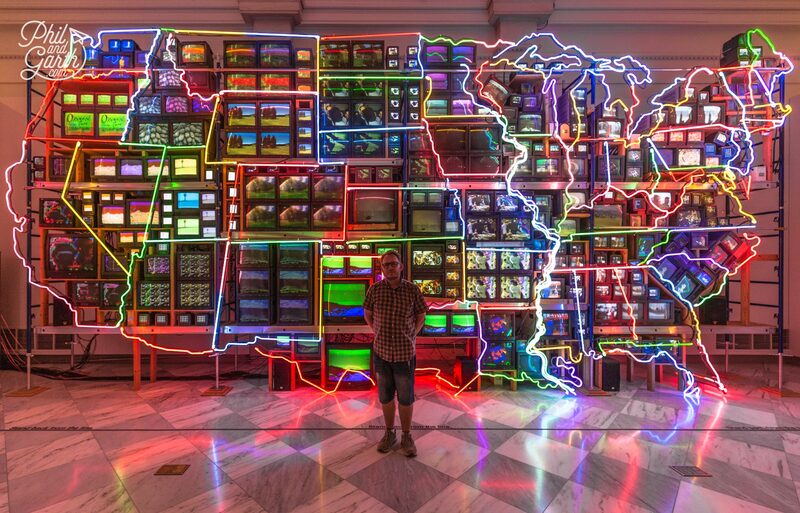 Designed by Nam June Paik, 336 television screens form a wall of 50 USA states and show imagery and footage that reflect the individual states. Garth thought the neon outlining the states suggest motel neon signs you’d see on a USA road trip. 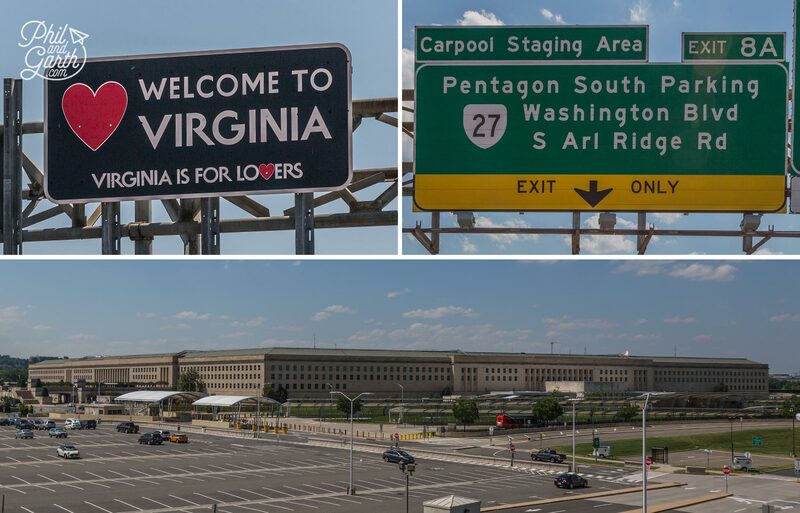 We paid for 2 tickets on the Big Bus Tour to head out of Washington DC to visit Arlington Cemetery in neighbouring Virginia and to see The Pentagon building en route from the motorway. Our guide Cassie was the best, didn’t stop talking or stop for breath, she was full of knowledge and really keen to give her “friends” a great tour, would recommend. Arlington Cemetery is a military cemetery where across a 624 acre site, the dead from all of America’s wars and conflicts are buried. It’s also the resting place for John F. Kennedy where an eternal flame burns next to his grave. After visiting Arlington we stayed on the Big Bus for a while just to see more of the city from the comfort of our seats. The city’s layout is based on Paris’s grid system, look closer at the details on buildings and it’s amazing to see the bald eagle symbolism which is everywhere. 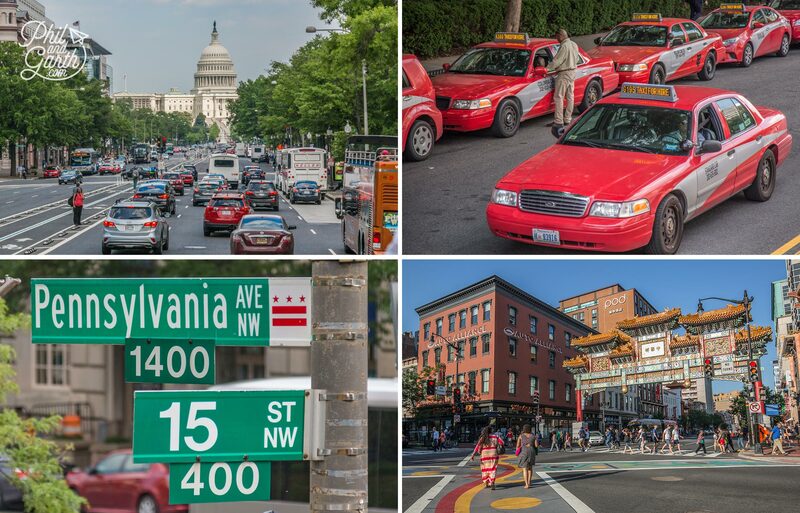 Also did you know taxis in Washington DC are red? It dawned on us how amazingly green Washington DC is, the city is known as ‘The city of trees’ because it has more variety of trees than any other city in the world. 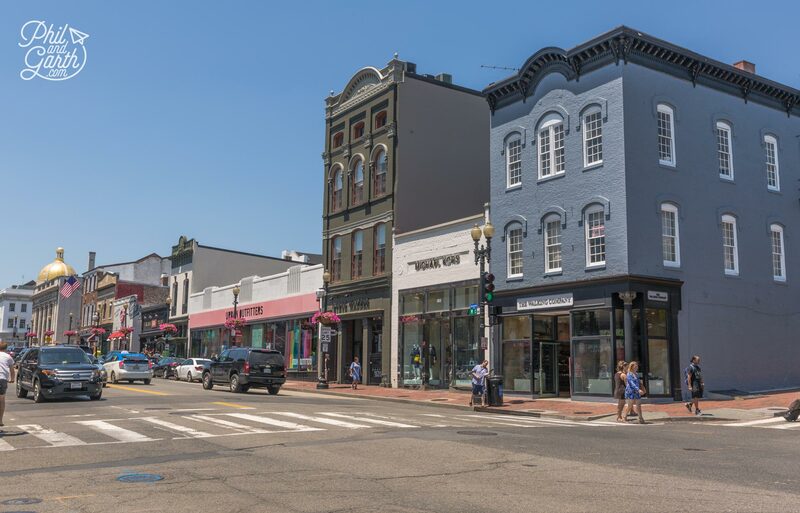 Georgetown is Washington DC’s historic neighbourhood which fans of House of Cards will recognise. It dates back to the 18th century and still retains some old warm charm with cobbled streets and a canal. We spent an afternoon shopping on M-Street and tried a ‘handcrafted’ Prez Obama Burger at The Good Food Bakery, which was ok nothing special. 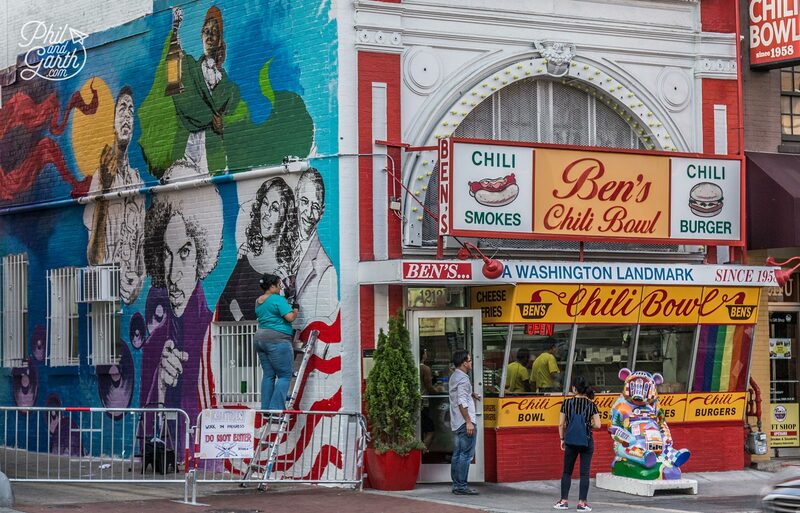 One of our favourite eats was at Ben’s Chili Bowl just a few stops on the Metro from our Chinatown hotel. 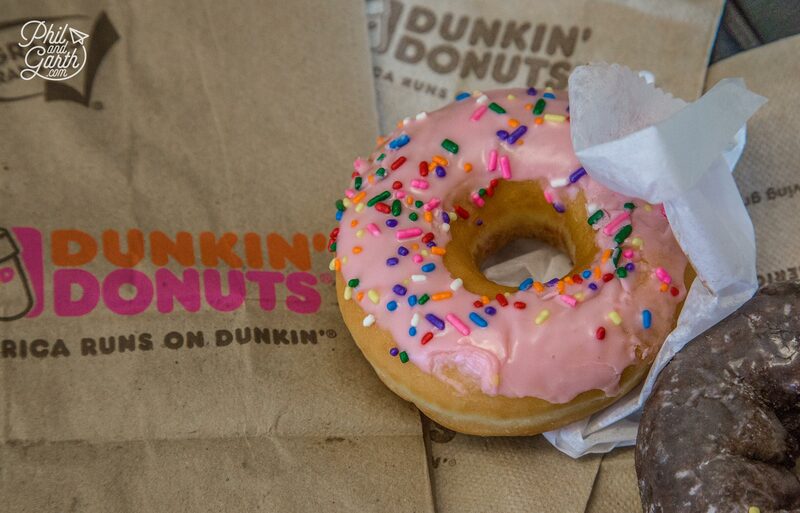 Founded in 1958 by Virginia and Ben Ali, this place is a Washington institution. 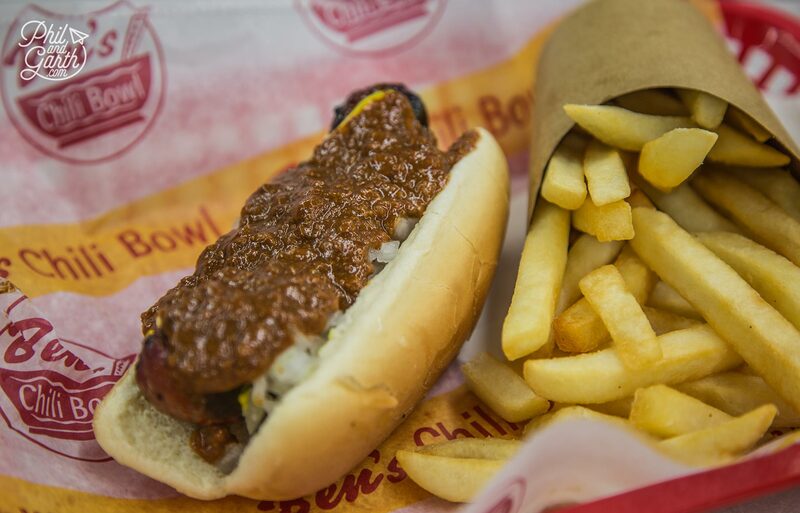 We ordered 2 Chili Half-Smoke hotdogs and chocolate shakes. We could taste the smoke and the chilli is great too! It leaves you with tingling lips for a few minutes. Be sure to check out the street art to the left and right streets when you leave, Garth had a nice chat to the artist who was painting the mural. If you live in the USA you can even get the hotdogs delivered to you! 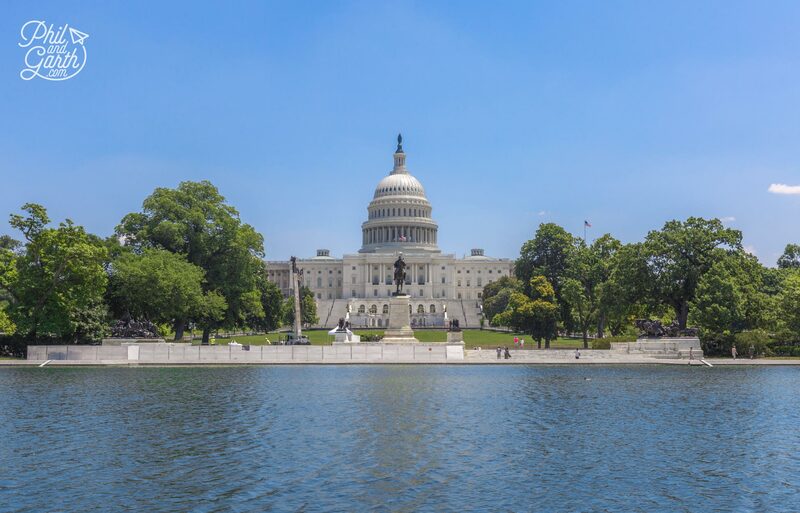 We were visiting in June to coincide with Capital Pride – Washington’s annual LGBT pride festival. The 4 day celebration is packed with parades, events, parties and people! 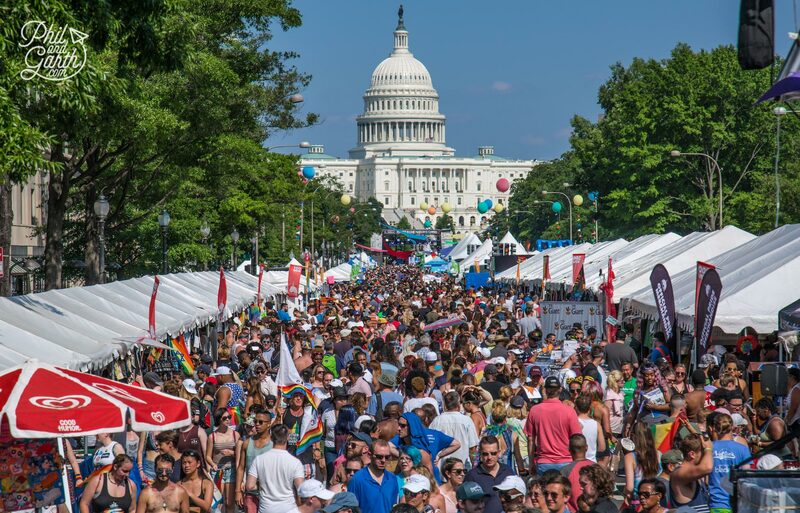 Capital Pride finishes with a free family-friendly festival on Pennsylvania Avenue. Tip #1: Summers are scorching hot – you’ll need sunscreen, sunglasses and lots of water! It was 35ºC in June when we visited. Tip #2: On Metro escalators walk on the left, stand on the right – just like the London Underground. 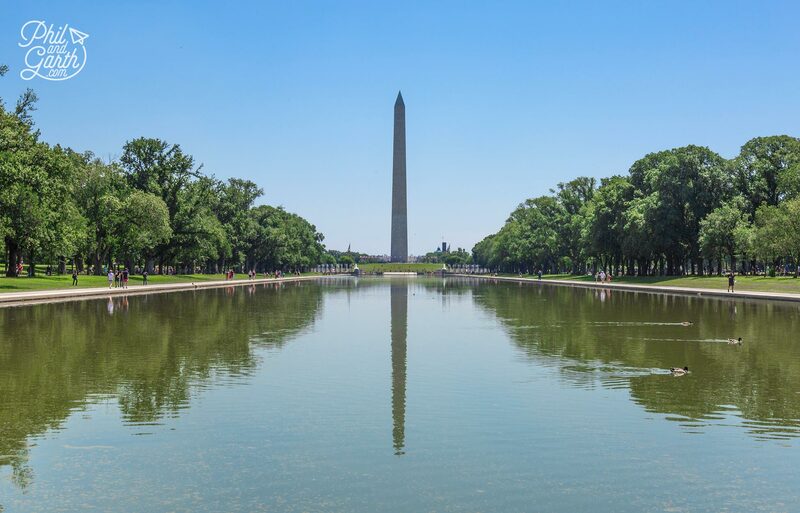 Tip #3: Use the reflections in water pools near monuments to compose awesome photos. Tip #4: Cherry blossom viewing in the Spring is just as good in Washington DC as it is in Kyoto, Japan. 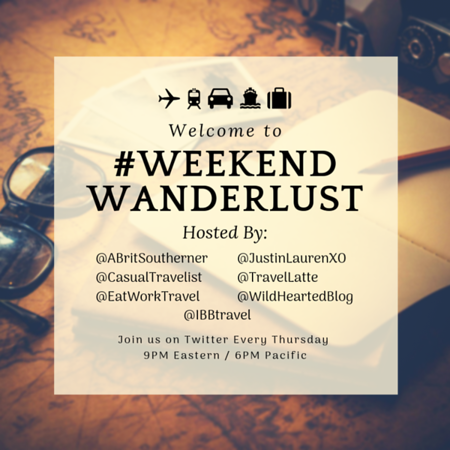 Tip #5: You can’t see everything, so make a rough plan on what interests you before you go. We planned our trip using The National Park Service website. 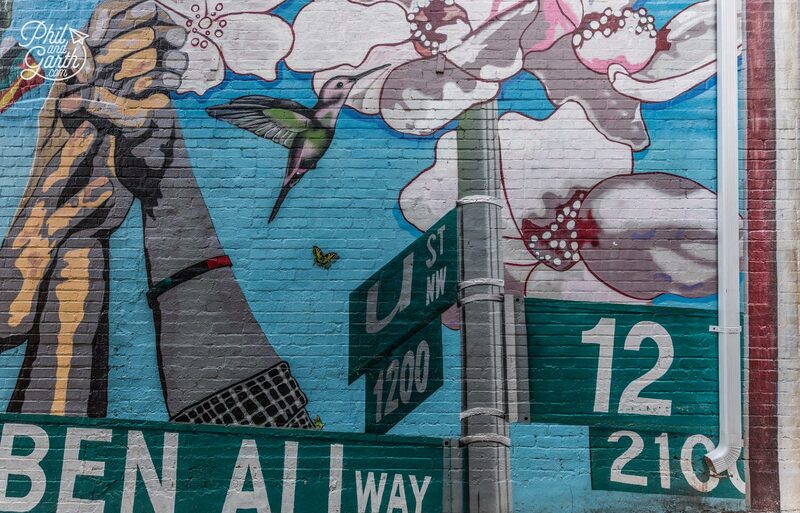 We paid for 4 nights at The Pod DC Hotel located in Chinatown. Washington DC’s official tourism website was handy for planning parts of our trip. 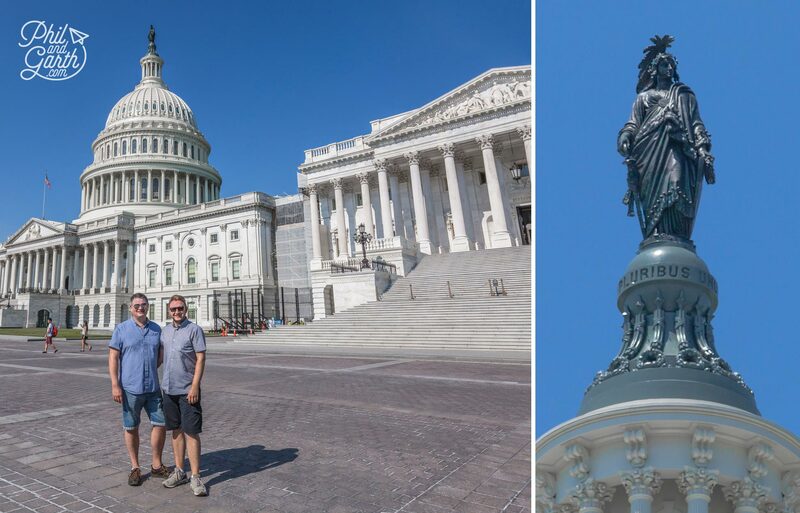 We booked the US Capitol Tour 2 months ahead of our visit. Washington DC is one of my favorite cities here in the US. 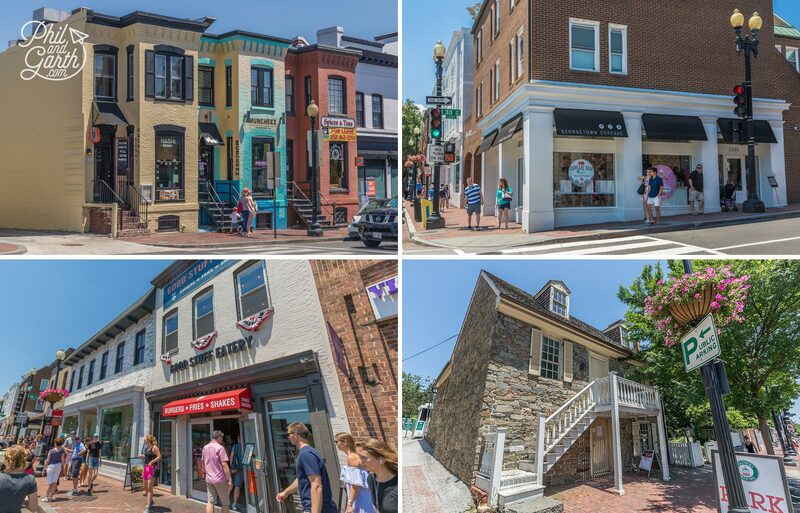 I’ve taken my kids there many times and we’ve done most of the “famous” things but I’ve yet to do Georgetown. It’s been awhile since I’ve been so I think it’s time for a return trip. Great guide! 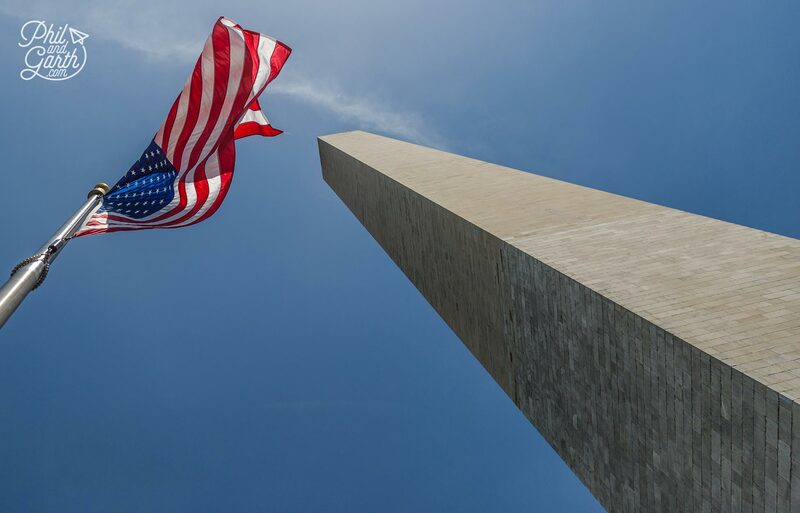 I had always wondered why the Washington monument was in two colours of stone. 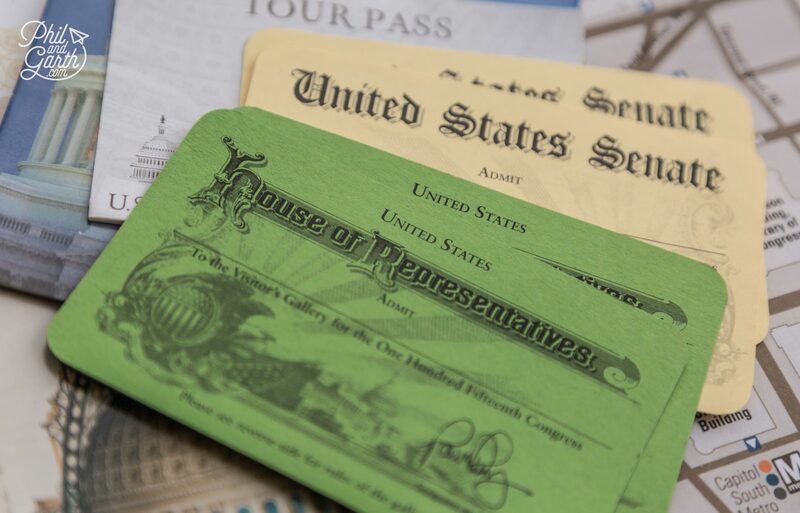 Like you said, it would take weeks to see all the museums in D.C. One of my favourite tours in D.C. has been the Bureau of Printing and Engraving ( I cal l t the US Mint). Incredible blog. So much detail. You really covered all the angles and I loved the humour interespersed. Well done. This was brilliant . Thank you so much for this guide. Somehow, I only thought of DC as the place of the White House, Capitol building and Jeffersonian. Though this is so much more insightful and appealing! The Korean War Veterans Memorial choked me up a little, how well done. Wow, what a detailed post! I’ve been to DC, but it was several years ago, so this makes me want to go back sometime 🙂 Sounds like a great trip!